When I read your blog, the word "LOVELY" just keeps coming to mind. I will pray for you as you make your move this week. What a wonderful post. I got sidetracked reading the whole thing! But it makes me sad to think that you are sad to come back. Let's reverse that entire post and remember that someday soon, you'll be glad to be back home. Family and friends await! Yay! I will pray for you as you get through this week. Keep us posted on how the dog is doing. I worry about them on such a long plane ride. Clicked over from The Red Clay Diaries. Know similar feelings, though all of our moves have been domestic. I love high tea, tea parties, etc. 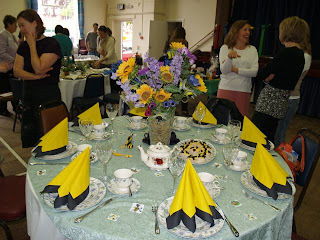 Several churches where we have attended I have hosted a tea table similar to this experience. Yes, friends are family you choose when you live away. Joyce - I am thinking of you all this week and wish you strength through the move. We love you and Tim and can't wait to see you on this side of the pond! I do enjoy reading your blog, and I think I'm going to be sad when you leave England. What will you write about? Well, I'm sure it will be good. Oh, and that Globe Theatre--what a work of art!! What a great organization. Looks like you all had some wonderful times together. 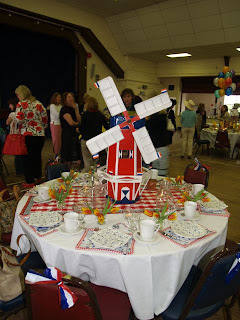 I love all the table decorations & you ladies in your hats. Joyce, you will be in my thoughts and prayers this week. I hope you are blessed immediately with sweet, loving neighbors in your new city.